This chapter describes how to configure an active/passive Apache HTTP server in a two-node Red Hat Enterprise Linux High Availability Add-On cluster using pcs to configure cluster resources. 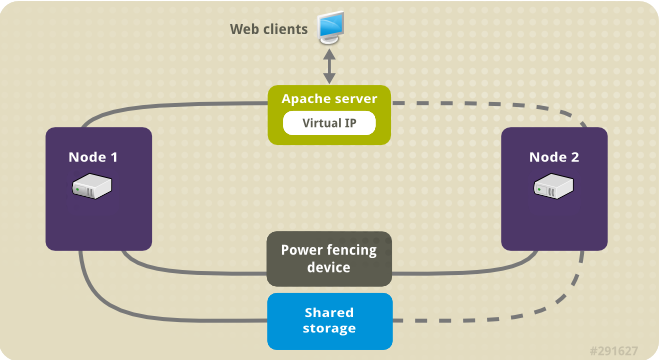 In this use case, clients access the Apache HTTP server through a floating IP address. The web server runs on one of two nodes in the cluster. If the node on which the web server is running becomes inoperative, the web server starts up again on the second node of the cluster with minimal service interruption. Figure 2.1, “Apache in a Red Hat High Availability Two-Node Cluster” shows a high-level overview of the cluster. The cluster is a two-node Red Hat High Availability cluster which is configured with a network power switch and with shared storage. The cluster nodes are connected to a public network, for client access to the Apache HTTP server through a virtual IP. The Apache server runs on either Node 1 or Node 2, each of which has access to the storage on which the Apache data is kept. A two-node Red Hat High Availability cluster with power fencing configured for each node. This procedure uses the cluster example provided in Chapter 1, Creating a Red Hat High-Availability Cluster with Pacemaker. Configure an ext4 file system mounted on the logical volume my_lv, as described in Section 2.1, “Configuring an LVM Volume with an ext4 File System”. Configure a web server, as described in Section 2.2, “Web Server Configuration”. Ensure that only the cluster is capable of activating the volume group that contains my_lv, and that the volume group will not be activated outside of the cluster on startup, as described in Section 2.3, “Exclusive Activation of a Volume Group in a Cluster”. After performing these procedures, you create the resource group and the resources it contains, as described in Section 2.4, “Creating the Resources and Resource Groups with the pcs Command”.